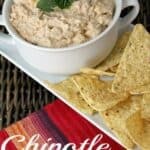 Chipotle Corn Dip recipe, the BEST spicy corn dip recipe! EASY to make and no cooking necessary. Use fresh, canned, or frozen corn. Naturally gluten-free. 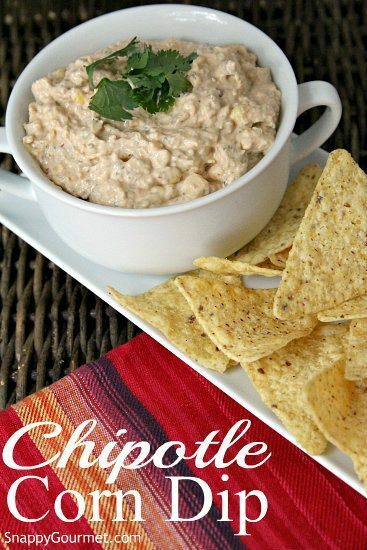 Chipotle Corn Dip recipe, the best spicy corn dip that is also easy to make! Perfect summer appetizer for a potluck or party and no cooking necessary. 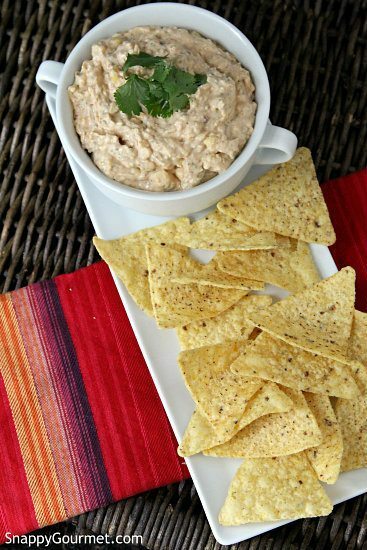 A fun Mexican twist on an easy dip full of flavor! This corn dip recipe is so easy to make. You just throw all the ingredients in a food processor or you could mix by hand if you don’t have a food processor. We were heading to a party earlier this summer and I need to come up with a quick dish. So sorry for the lack of and not so great pics. Had to snap some quick! We had leftover corn on the cob in the fridge (kids wanted corn when we were at the grocery store but then refused to eat it when cooked, grrrrrr…..) Therefore I used leftover cooked corn on the cob (just cut if off the cob…), but you could also use defrosted frozen corn, or even drained canned corn. They’ll all work just fine. Just don’t use RAW corn off the cob. 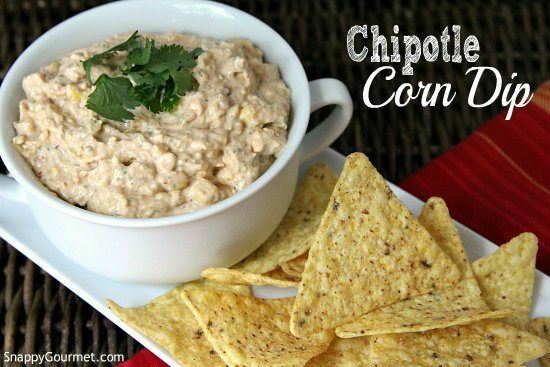 Serve this Chipotle Corn Dip with tortilla chips, Fritos, or even veggies for a healthier snack! The dip itself is naturally gluten-free and you could also substitute lower fat ingredients and it will still turn out great! Enjoy! 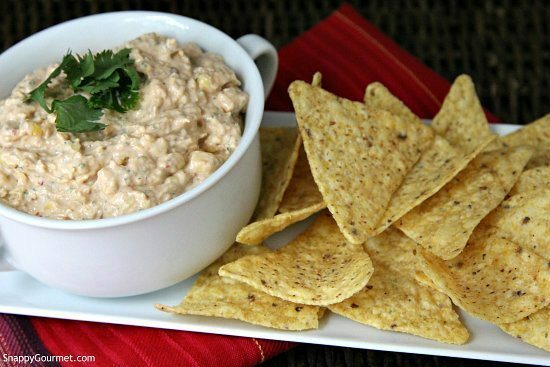 Chipotle Corn Dip recipe, an easy spicy corn dip full of flavor! Place cream cheese, mayonnaise, sour cream, cheese, cilantro, chipotle, salt, pepper, garlic powder, and onion powder in food processor. Process until smooth. Add corn and pulse just about 2-3 times or just until combined being careful not to over process corn. Store covered in the refrigerator and serve with your choice of chips or vegetables. SNAPPY TIPS: If you don't have a food processor, use an electric mixer or chop chipotle finely and mix by hand with other ingredients. SNAPPY SUBSTITUTIONS: You can use lowfat or light cream cheese, mayonnaise, sour cream, and/or cheese. I live for dip! If I had my way, I’d eat it every day :) This is perfect for all that fresh, summer corn! Lisa – this looks absolutely delicious! You had me at chipotle. And love that it’s corn based. would love to make this with freshly picked sweet corn…mmmmm!